Get your blog /website indexed by major search engines, such as Google and Bing, is very important, especially for a new site. The stat from comScore said in 2011 that more than 67.7% of search traffic were coming from Google, and 26.7% from Bing. If your site is not indexed by search engines, it's not searchable. Then how to get web or blog site indexed by Google? You can submit your site to Google and submit your site's Sitemap by using Google Webmaster Tools. Just type in your site url, and the CAPTCHA code, click on Submit Request, you done. Once your site url has been submitted, Google search spider starts to go to your blog website to pick up the webpages. But it doesn't mean Google will be able to "see" or find all of your pages, that's why you need to submit a Sitemap to Google. Sitemap is a list of the web page urls on your web or blog site. Submit a Sitemap helps make sure that Google knows about all the pages on your site, including those URLs that may not be discoverable by Google's normal crawling process- this is especially important for new blog or website which has few external backlinks to it. A. To submit Sitemap to Google, you have to first generate a Sitemap for your site. The Sitemap can be generated by using Downloadable Sitemap Generator Tools, or Online Sitemap Generators. B. 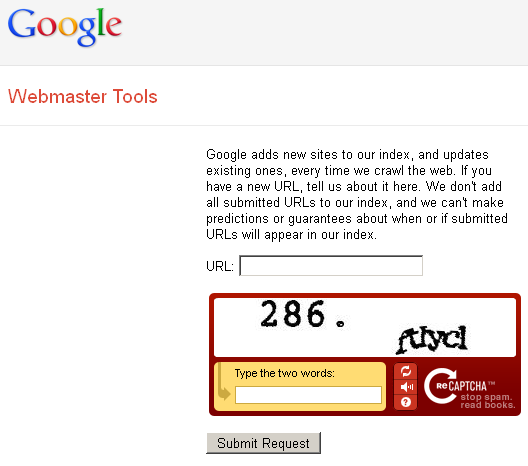 Then go to Google Webmaster Tools at http://www.google.com/webmasters/tools/, sign in with your Google Account. D. Click on Continue. The Site verification page opens. E. (Optional) In the Name box, type a name for your site (for example, Blogger Journey). F. Select the verification method you want, and follow the instructions. G. Once your site has been verified, from the Webmaster Tools dashboard, click on Sitemaps-> Add/Test a Sitemap, type in your Sitemap url. How to add sitemap in yahoo, ask and msn? I have submitted my blog feed url but it is not getting index.... Is it gonna take some time??? Yes, my experience is, it takes several days. I have already submitted my blog in Google Webmaster tool still the crawling rate is not really good. Any suggestion ? The points that u have gave really have some effects as the google really allows all of it . .